The onion is a member of the lily family, a close relation of garlic. It is often called the “king of vegetables” because of its pungent taste. There are many varieties of the onion—white, yellow, red and green globes. They also differ in size, color and taste. The smaller onions come in many varieties such as the green onion, or scallion which includes chives, leeks and shallots. The smaller the onions, the more pungent they are. They are the ones that make your eyes water when you cut them, when the organic sulphur is released into the air. There is considerable variation in composition between different varieties and they also vary with the stage of maturity and the length of storage. Onion is a powerful anti-septic that is rich in vitamins A, B and C. It is a potent source of folate, calcium, phosphorus, magnesium, chromium, iron and dietary fiber. 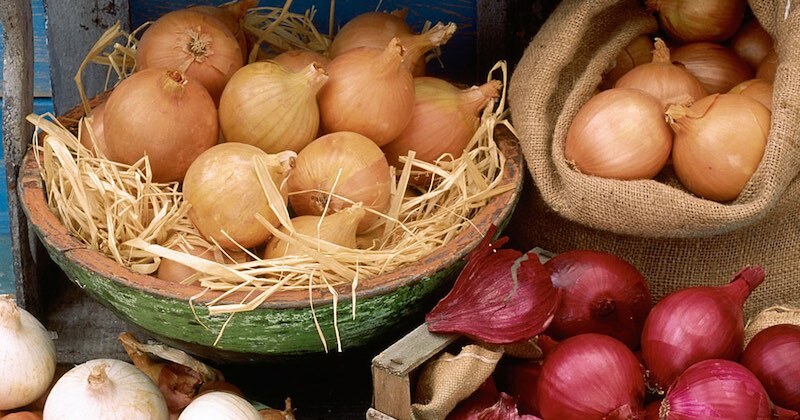 Ancient records reveal that onions have been used as far back as 4000 B.C. as a cure-all for many illnesses. In WW II, the vapors of onion paste was used to reduce the pain and accelerated the healing of soldiers’ wounds. Anemia: The high content of iron in onion makes it beneficial for the treatment of anemia. Anti-coagulant: Just by eating half a medium raw onion daily can significantly lower cholesterol and help prevent heart attacks. Anti-inflammatory: The anti-inflammatory agents in onion are useful in reducing the symptoms of inflammatory conditions such as arthritis and gout. Anti-septic: Fights infection bacteria, including E.coli and salmonella, and is effective against tuberculosis and infections of the urinary tract, such as cystitis. Blood pressure: Whether you eat it raw or cooked, onions help to lower blood pressure naturally. It also thins the blood, dissolve blood clots and clear the blood of unhealthy fats. Cholesterol: Eating half a medium raw onion daily significantly helps to correct thrombosis, lower the LDL cholesterol and prevents heart attacks. Colon cancer, prevention: Fructo-oligosaccharides in onions stimulate the growth of good bacteria in the colon and help reduce the risk of tumors developing in the colon. Constipation and flatulence: Add plenty onion in your cooking to help relieve chronic constipation and flatulence. Diabetes: Chromium in onion helps diabetics’ cells respond appropriately to bringing down the insulin level and improve glucose tolerance. Diuretic and blood cleansing: Help counter fluid retention, urinary gravel, arthritis and gout. Ear disorder: In some culture, cotton wool is dipped into onion juice and put into the ear to stop ringing in the ear. Hair loss: A study has shown that applying onion juice on scalp twice a week for 2 months will cause hair regrowth. Definitely cost much less that those hair tonic. Immune booster: The pungency increases blood circulation and causes sweating. Useful in cold weather to ward off infection, reduce fever and sweat out colds and flu. Osteoporosis: A compound has recently been identified in onions that prevents the activities of breaking down bone. Especially beneficial for women who are at risk for osteoporosis as they go through menopause. Respiratory: Mix equal amounts of onion juice and honey and take 3-4 teaspoons of this mixture daily. It helps liquefy mucus and prevents its further formation. It is also one of the best preventive potion against common cold. Sexual debility: Onion is a potent aphrodisiac and stands second only to garlic. For this, the white variety is most effective. Urinary tract infection: Boil some onion in water till half of the water evaporated. Sieve the onion water, leave to cool and drink. The anti-bacterial properties help to relieve the burning sensation in urination. 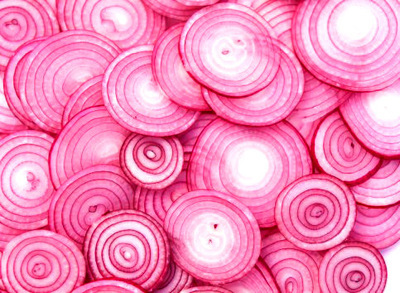 Here are more magical and miraculous uses of onions. When buying onions, choose onions that are well-shaped, have dry and crisp outer skins. Avoid those which are already sprouting or have signs of decay, wilting or discolored tops. Onions can be stored at room temperature but keep them in a well ventilated area, away from bright light to prevent roots from growing. Do not put them together with potatoes as they will absorb the moisture and ethylene gas from potatoes and rot faster. To prevent tears when cutting onions, chill the onions for about an hour before peeling, or peel them in a tub of water. It is the sulfur compounds that is released in the air that irritates the eyes. Cut onions are to be stored in an air-tight condition to prevent oxidization. Use within one or two days. Even though onions have many health benefits, they are also very potent. As in anything good, always remember to take only in moderation. Must try this. I do juice every day. But didn’t do onions.